I wanted to make two fruity cocktails and two non-fruity so after asking a few people for suggestions, I decided on White Russian as one of the non-fruity ones. I don’t think I’ve ever had it before as a cocktail but it sounded good to me in cupcake form! I did a quick google search and came across a recipe on Baked Perfection. Want to sample another cocktail? Since I’d come up with decorations for all the others, I wanted to come up with a decoration for these too. I’d already done biscuits on top of two of them so I wanted to do something different. I thought for ages and in the end decided to keep it simple and go with some chocolate squiggles. Although they were simple, they had the look I was after. I melted 50g of white chocolate and 50g dark chocolate and put them into piping bags. I then just piped the squiggles onto baking paper (I didn’t follow a template, I just zig-zagged from side to side leaving a long straight line at the end to push into the buttercream). 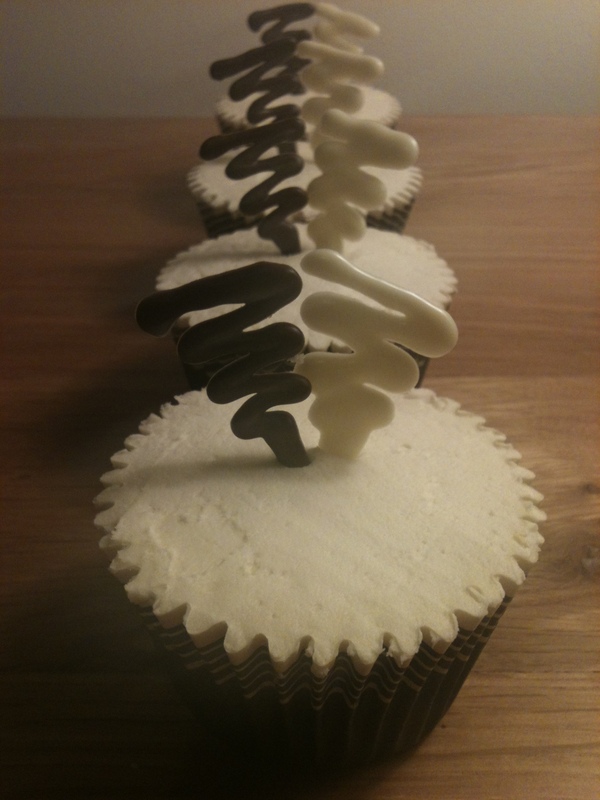 I then left them to dry and once I’d spread some buttercream on top of each cupcake, I pushed a white and a dark chocolate squiggle into the top of each. I made way more than I needed to since they were prone to snapping and it gave me the chance to use the ones which looked the best – the left over ones got eaten, I mean, melted down again and used to decorate some other cakes. Preheat oven gas mark 5. Line a muffin tin with cases. In a large bowl, mix together the flour, baking powder, and salt and set aside. In a seperate bowl or in a stand mixer, beat together the sugar and butter until combined. Add egg and egg white, one at a time. Then add the vanilla, vodka, and half (30ml) of the Kahlua. Gradually add the flour mixture in three additions, alternating with the milk in two additions, ending with the flour mixture. Bake 17 -20 minutes, or until a toothpick inserted in the middle of a cupcakes comes out clean. 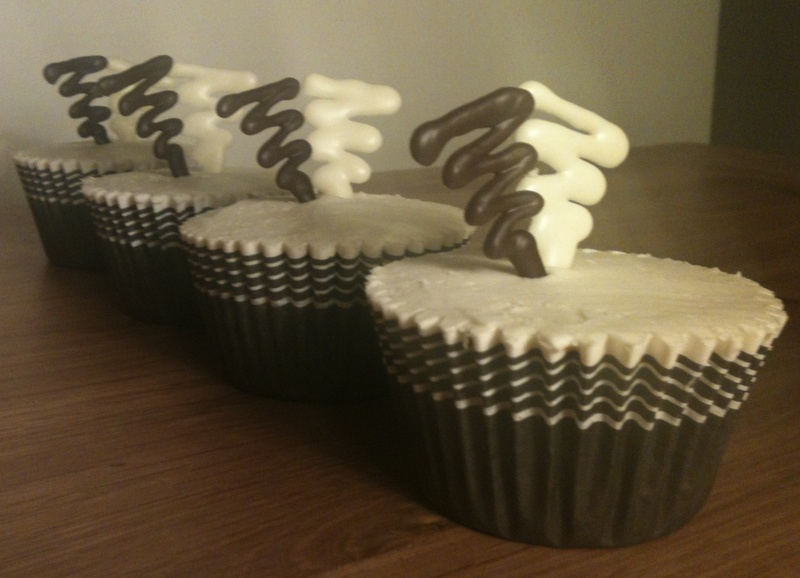 While the cupcakes are still warm, brush the tops with the remaining 30ml Kahlua. Remove from pan and cool completely on a wire rack before frosting. Beat butter until creamy. Add salt. Add powdered sugar 1 cup at a time, beating until combined. Add Kahlua 1 tablespoon at a time until you reach desired consistency. Spread or pipe on top of the cooled cupcakes.